Riveting performances, artistic showdown and a weekend of fun activities were the highlights from the recently concluded #INTIFRESH carnival held to commemorate the launch of INTI International College Subang’s new and trendy South Block. Winner of Art Battle Malaysia, Anna Sabrina proudly standing by her final and winning art piece. Starting off with an appreciation for the arts, Art Battle Malaysia organized by Ruby Subramaniam, was a breath-taking experience for audiences who watched 11 artists go head on in a 30-minute art battle to which audiences voted for their favourite pieces of artwork at the end. 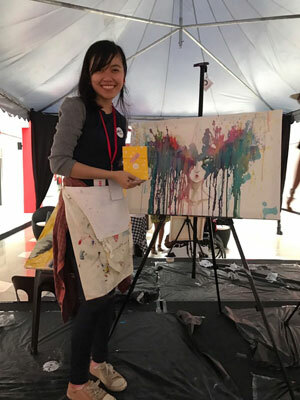 The speed painting battle which has run internationally in US, Canada and Brazil was brought to Malaysia to create better exposure for local artists. Featuring an international line up of artists all the way from Iran and India including local Malaysian superstars, the exhilarating showdown showcased various styles of painting, different levels of artistic skills and deeply emotionally-connected art pieces that came to life on a blank white canvas within a span of 30 minutes. What would seem like an impossible feat for most people, looked like a walk in the park for the first round of 11 artists who were then shortlisted to six semi-finalists and eventually down to two finalists. Each round saw the artists rigorously and meticulously creating inspiring pieces to win the crowd over not just by look and feel but also through the techniques applied. Eventual winner Anna Sabrina from Malaysia received the majority vote on the final round for her beautiful and colourful interpretation of a person’s mind being blown. Sabrina, who had previously joined Art Battle Canada in 2015, was pleased to come back and join the Malaysian leg and was ecstatic to be named the champion of Art Battle Malaysia 2017. Apart from the intensity of the battle, there were some intense moments in the purchase of the artwork which were created that day. Some of the artwork were auctioned off immediately and bought by audience members who were captivated by the artists’ works. Model parading INTI’s Diploma in Fashion Design students’ creation during the fashion at #INTIFRESH music festival. Progressing into the evening, #INTIFRESH ended on a high note with a music festival. Held timely as an avenue for college students and SPM leavers who had just received their results to have a fun night out with friends after the stresses of exams and results, the music festival saw over 500 participant singing and dancing along to the music of some of today’s recognized Malaysian artists. 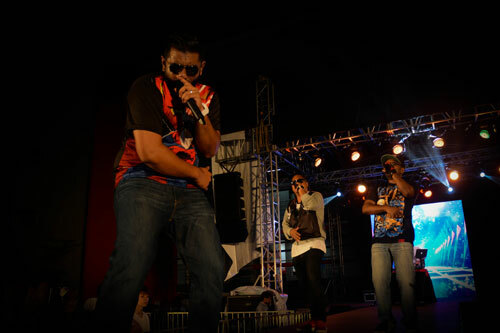 The acts included local crunk legends and international award winning hip-hop group, K-Town Clan; AIM (Anugerah Industry Music) nominee, Back2Basixx and singer/songwriter and rising star, Talitha Tan. The evening also featured a stylistic varied fashion runway showcase of clothing designs by INTI’s Diploma in Fashion Design graduates and current Semester 2 and 3 Diploma in fashion design students. The shy but vocally dynamic Talitha Tan opened the night with a set of her own hit singles and songs by local Malaysian singers. Following suit was the singing quintet, Back2Basixx whose mellifluous voices and spot on harmonies swooned the crowd especially with their take and tribute to Boyz II Men’s popular song “End of the Road”. Strutting down the runway sass and poise were models from Runway Productions modelling agency, who wore the artistic creations of 17 graduates and students from INTI’s diploma in fashion design programme. (left to right) INTI Alumni, Ganeshkumar Karunagharan a.k.a BigBo with his band members Roshan Jamrock and Vidya rocking the stage and getting the crowd hyped up with their hit songs. Closing the night with their hard and fast rhythms and heart thumping beats, K-Town Clan took to the stage their stylistic charm and charisma to which the crowd responded with roars and cheers. One of its group members, Ganesh Kumar Karunagharan, or more widely and popularly known by his stage name, BigBo, is an INTI alumni and was the winner of INTI’s Outstanding Alumni Award for Excellence in Entertainment 2016. The music festival came to an end with a rocking dance party by DJ Mastermind. The newly redeveloped South Block, offers a fresh, cosmopolitan learning environment to suit its dynamic student population. Leveraging innovative and creative designs within its classrooms and throughout its five collective blocks, the new South Block offers an enhanced teaching and learning setting that emphasises openness and collaborative learning.